Finally, we’ll let you know where it is best to buy magnetic eyelashes so that you can pick up a pair for yourself and see what all the hype is about. 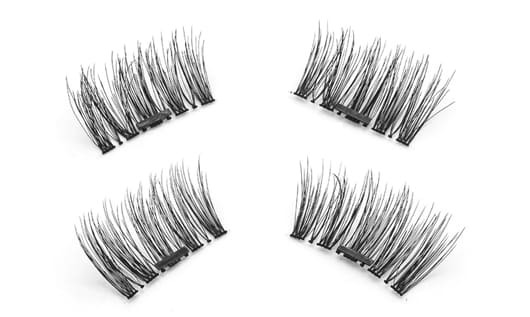 Finding the right pair of magnetic false eyelashes is not always easy, but we hope that this product overview and walkthrough can be of assistance. You might be wondering, “do magnetic eyelashes work”? They definitely do, but as we explained earlier, the application sometimes comes along with a slight learning curve. But let’s face it, even the application of traditional false eyelashes takes a bit of practice. Each set of magnetic false eyelashes normally arrives with its own set of instructions. When you open up your lash case, you might be wondering why there are 4 separate lashes. That is because 2 lashes per each eye is required with magnetic lashes. The section that is placed underneath your natural lashes is normally marked with some sort of signifier, for example a colored dot. Check your own eyelash instructions to find out exactly how to tell the bottom pieces apart from the top ones. With your eye open, place the bottom lash just below your upper lashes, pushing it into place, which means as close to the lash line as possible. Close your eye shut. Place the upper section of the lash directly above the upper natural lash, lined up with where you are keeping the lower section, and try to get the lash as close into your natural lash line as possible. Once the lash is placed above, it will connect magnetically with the bottom lash, creating a bond that won’t easily budge. If you didn’t quite get it right the first time, keep trying until you can apply them more smoothly. Remember that many people have difficulties with magnetic eyelashes at first, but with a bit of practice, you’ll have the process down in no time. If it’s time for you to remove your magnetic lashes, using your thumb and forefinger, slide the two parts of the magnetic eyelash apart. Do not tug or pull at the lashes for this can damage your natural eyelashes and ruin their shape. Instead, try to gently caress the magnetic lashes apart from one another. If you’re asking, “are magnetic eyelashes safe”? – the answer is a total yes! 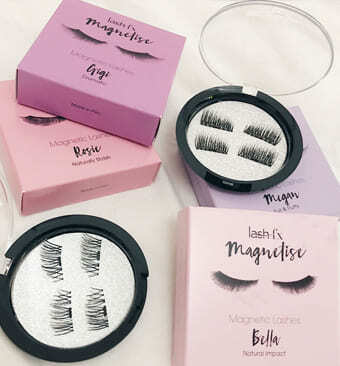 It is even arguable that magnetic falsies are possibly safer than traditional adhesive fake lashes because it does not require any harsh chemicals to adhere magnetic lashes, all thanks to the magical, super scientific power of magnets! Thanks, Science. Now that magnetic eyelashes have become even hotter, many brands have begun developing their own versions of magnetic fake eyelashes. After reading many reviews on magnetic eyelashes, as well as taking matters into our own hands, it is clear to us which sets are the favorites of the bunch. 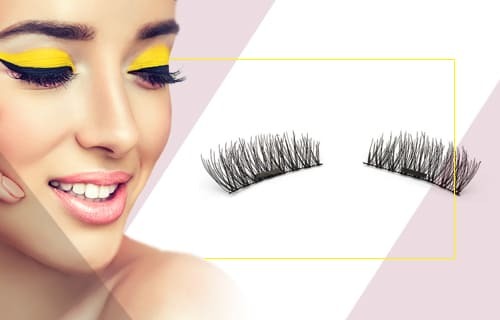 In this section, we will explain where you can buy magnetic eyelashes, predominantly the most popular styles, and we’ll follow that up by presenting some of the best magnetic falsies that are offered on the market. At the moment, beauty mega stores like Sephora and Ulta stock some magnetic lashes, both in-store and online. Currently, Sephora sells their Sephora Collection One Two Lash, which has grown to become one of the more popular magnetic eyelash styles. Ulta, on the other hand, offers two different brands of magnetic eyelashes, a few options from both Ardell and Eylure. The Ardell Magnetic Lash eyelashes are available in the styles Magnetic Lash Accent #001, Magnetic Lash #110, and Magnetic Lash Demi Wispies. A magnetic lash specific applicator is also available for purchase, called the Ardell Magnetic Lash Applicator. Regarding the Eylure styles, Ulta sells the Luxe Magnetic Opulent Accent Lashes, the Luxe Magnetic Baroque Corner Lashes, and the Luxe Magnetic Baroque Accent Lashes. In addition to beauty stores, Amazon also sells a selection of magnetic lashes, some of which we’ll be discussing in the next section. Finally, if your local drug store or department store has a large makeup section, there’s a fair chance that they also stock magnetic lashes. Target, CVS, and Walgreens, for example, do. Because magnetic eyelashes are so trendy these days, it is not difficult to find them either online or in-store. Magnetic eyelashes might not be for everyone, but they do certainly have their place in the world of makeup, and from our experience, we are actually quite happy with this newly risen beauty trend. Of course, magnetic false eyelashes don’t come without their downsides. For some, the price simply is not worth it. These lashes normally cost similar to comparable classic falsies (the kind you apply with regular lash glue), and although magnetic lashes can be high quality and offer a very desirable look, not all people are a fan of their appearance. For others, magnetic falsies are ideal, due to being adhesive, and therefore chemical-free, especially for those with sensitive eyes, and once the technique of application is learned, it is often easier to apply magnetic lashes on-the-go than it is applying strip false eyelashes. Overall, we personally quite like magnetic eyelashes and their overall look, and we believe this trend could continue to grow throughout 2019. We hope that this article was able to provide all the necessary information regarding magnetic eyelashes, along with which options you could try if you are on the hunt to discover the right pair.